At S$1 a piece, I couldn't resist. I bought two to try. Yes, just two. Now I wish I'd bought more... One went to Mom, so I only had one left to for a Mango Mousse Cake I've been wanting to try. Makes a short 8" round cake. For a more average-height cake, double the recipe. Combine all (A) ingredients, whisk till well combined and frothy. Sift (B) over (A) and whisk till just combined. Whisk egg whites till frothy. Add cream of tartar and sugar, and whisk till peaks have just turned stiff. Loosen egg yolk mixture with some whites. Then fold the remaining egg whites into the egg yolk mixture till the streaks disappear. Push batter into baking pan and smooth the top with a spatula. Bake at 170*C for 30-40 min till done. Invert on a rack to cool. When completely cool, slice the cake into as many layers as you desire. Whip the cream till peaks are soft. Add sugar, and whip till peaks are stiff. Add mango puree and whip briefly till just combined. If mixture is too soft, chill for an hour or so till the cream firms up. 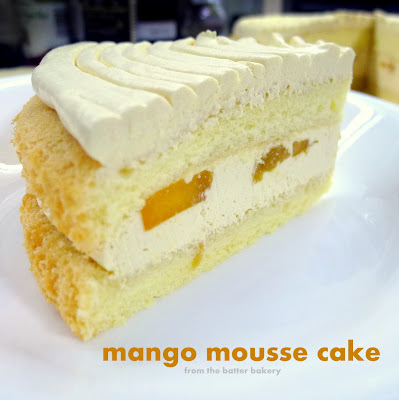 Once you have your cake layers and mango mousse ready, it's time to put it all together! 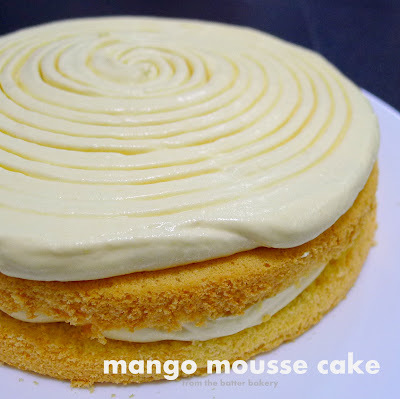 On top of each cake layer, slather on some delicious mango mousse. 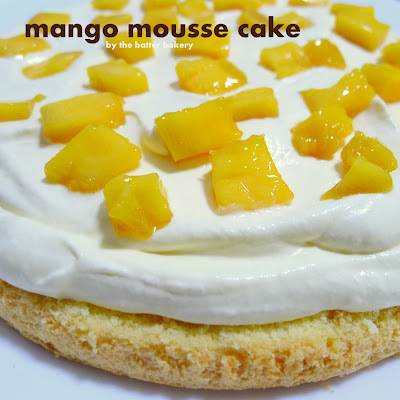 Generously sprinkle the diced mangoes on top and cover with just a little bit more mousse. Place the other cake layer on top and press gently. Then slather on the rest of the mousse on top. As I made this on a weekday night, time was very limited, so I opted for the rustic look. With the tines of a fork and my trusty Ikea lazy susan, I dug the end of the fork into the mousse and gently turned the lazy susan. Gradually move the fork towards the centre of the cake and a simple decorative pattern emerges. Now, what d'ya think of that! 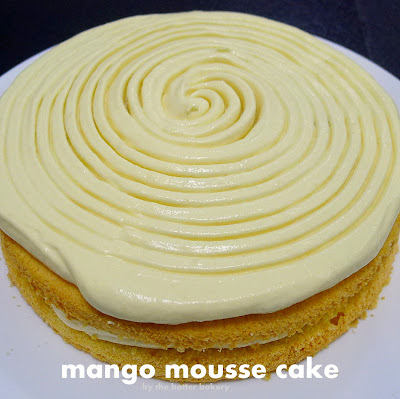 I'm submitting my rustic mango mousse cake to Aspiring Bakers #5: Fruity March (March 2011) hosted by Jess of Bakericious.